Named Elizabeth Eleanor Siddall, after her mother, 'Lizzie' Siddall was born on 25 July 1829, at the family’s home at 7 Charles Street, Hatton Garden. Her parents were Charles Crooke Siddall, who claimed his family descended from nobility, and Eleanor Evans, from a family of English and Welsh descent. At the time of her birth, her father had a cutlery-making business but around 1831, her family moved to the borough of Southwark, in south London, a less salubrious area than Hatton Garden. In Southwark the rest of Lizzie Siddall's siblings were born: Lydia, to whom she was particularly close, Mary, Clara, James and Henry. Although there is no record of Lizzie Siddall having attended school, she could read and write, presumably having been taught by her parents. She developed a love of poetry at a young age, after discovering a poem by Tennyson on a scrap of newspaper that had been used to wrap a pat of butter; the discovery was an inspiration to start writing her own poems. The spelling 'Siddall' was changed to Siddal when Dante Gabriel Rossetti dropped the second 'l'. She was first noticed by Walter Deverell in 1849, while she was working as a milliner in Cranbourne Alley, London. Whether Siddal had any artistic aspirations is unknown, though she loved poetry. She was employed as a model by Deverell and through him was introduced to the Pre-Raphaelites. William Michael Rossetti, her brother-in-law, described her as "a most beautiful creature with an air between dignity and sweetness with something that exceeded modest self-respect and partook of disdainful reserve; tall, finely-formed with a lofty neck and regular yet somewhat uncommon features, greenish-blue unsparkling eyes, large perfect eyelids, brilliant complexion and a lavish heavy wealth of coppery golden hair." Though she was later touted for her beauty, Siddal was originally chosen as a model because of her plainness. At the time, Deverell was working on a large oil painting depicting a scene from Twelfth Night, showing Orsino, Feste, and Viola as Cesario. Like the rest of the Pre-Raphaelites, Deverell took his inspiration and forms from life rather than from an idealized or antique figure. He based his Orsino on himself, Feste on his friend Dante Rossetti. All that remained was to find a girl who could dress as a boy. Deverell's Twelfth Night was the first painting Lizzie Siddal ever sat for. When she started work as an artist's model, Siddal was in the enviable position of working at Mrs Tozer’s millinery part-time and was ensured a regular wage even if modelling did not work out, an unusual opportunity for a woman of her time. While posing for Millais' Ophelia in 1852, Siddal floated in a bathtub full of water to represent the drowning Ophelia. Millais painted daily into the winter putting lamps under the tub to warm the water. On one occasion the lamps went out and the water became icy cold. Millais, absorbed by his painting, did not notice and Siddal did not complain. After this she became very ill with a severe cold or pneumonia. Her father held Millais responsible and, under the threat of legal action, Millais paid her doctor's bills. It was thought that she suffered from tuberculosis, but some historians believe an intestinal disorder was more likely. Others have suggested she might have been anorexic while others attribute her poor health to an addiction to laudanum or a combination of ailments. In his 2010 book At Home, author Bill Bryson suggests Siddal may have suffered from poisoning, because she was a "devoted swallower" of Fowler's Solution, a so-called complexion improver made from dilute arsenic. Elizabeth Siddal was the primary muse for Dante Gabriel Rossetti throughout most of his youth. Rossetti met her in 1849, when she was modelling for Deverell and by 1851, she was sitting for Rossetti and he began to paint her to the exclusion of almost all other models and stopped her from modelling for the other Pre-Raphaelites. The number of paintings he did of her are said to number in the thousands. Rossetti's drawings and paintings of Siddal culminated in Beata Beatrix which shows a praying Beatrice (from Dante Alighieri) painted in 1863, a year after her death. Beginning in 1853, with a watercolour, The First Anniversary of the Death of Beatrice, Rossetti painted Siddal in many works. In this piece, she portrays a regal woman visiting the distinguished Dante as he writes his autobiography. Too absorbed with his overwhelming passion for Beatrice, Dante initially fails to notice the other people present in the room. Wearing a long, tailored blue gown and a teal headdress, she clearly occupies a position of considerable rank and beauty. After this work, Rossetti used Siddal in other Dante-related pieces, including Dante's Vision of Rachel and Leah (1855) and Beatrice Meeting Dante at a Marriage Feast, Denies him her Salutation (1851). In the latter painting, Lizzie Siddal represented Dante's obsession, Beatrice wearing a distinguished, long green dress and possessed exquisite beauty. Surrounded by throngs of supporters, she confronts Dante with a defiance that attests to her authority. 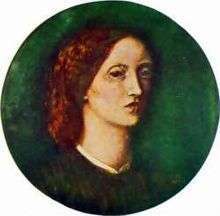 Elizabeth Siddal in an 1854 self-portrait. 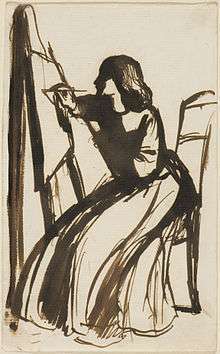 After becoming engaged to Rossetti, Siddal began to study with him. In contrast to Rossetti's idealized paintings, Siddal's were harsh. Rossetti drew countless sketches and painted and repainted her. His depictions show a beauty. Her self-portrait shows much about the subject, but certainly not the floating beauty that Millais painted and is historically significant because it shows, through her own eyes, a beauty who was idealized by so many famous artists. In 1855, art critic John Ruskin began to subsidize her career and paid £150 per year in exchange for all the drawings and paintings she produced. She produced many sketches and watercolours but only a single oil painting. Her sketches are laid out in a fashion similar to Pre-Rapaelite compositions illustrating Arthurian legend and other idealized medieval themes. Ruskin admonished Rossetti in his letters for not marrying Siddal and giving her security. During this period Siddal began to write poetry, often with dark themes about lost love or the impossibility of true love. "Her verses were as simple and moving as ancient ballads; her drawings were as genuine in their medieval spirit as much more highly finished and competent works of Pre-Raphaelite art," wrote critic William Gaunt. Dante Gabriel Rossetti completed "Beata Beatrix" a year after Siddal's death. 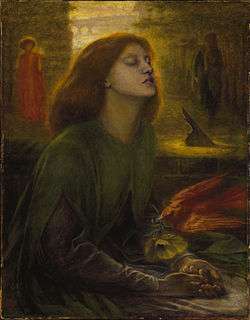 Rossetti represented Siddal as Dante's Beatrice in one of his most famous works, Beata Beatrix (1864–70), which he painted as a memorial after her death. The piece mimicked the death of Dante's love in his autobiographical work, Vita Nuova. In it, amidst a yellow haze of relatively indistinct shapes, including the Ponte Vecchio in Florence and figures of Dante and Love, Siddal sits, representing Dante's Beatrice. With an upturned chin and closed eyes, she appears keenly aware of her impending fate—death. A bird, which serves as the messenger of death, places a poppy in her hands. Critics have praised the piece for its emotional resonance, which can be felt simply through the work's moving colouring and composition. The true history of Rossetti and his beloved wife further deepens its meaning; although their love had waned at that point, Siddal still exerted a powerful influence on the artist. Perhaps Rossetti's most abundant and personal works were pencil sketches of Siddal at home. He began them in 1852, when he moved into Chatham Place with her and they became increasingly anti-social, absorbed in each other's affections. The lovers coined affectionate nicknames for one another, which included "Guggums" or "Gug" and "Dove" – one of Rossetti's names for Siddal. Rossetti taught her to paint and write. Both Rossetti and Ford Madox Brown supported and admired her work. In 1855 John Ruskin was shown Siddal's pictures and was deeply impressed. He offered to become her patron in an arrangement by which he provided financial support while she, in return, gave him the bulk of her work. Rossetti manifested the same idealization of Siddal in his sketches (most of which he entitled simply, "Elizabeth Siddal"), in which he portrayed her as a woman of leisure, class, and beauty, often situated in comfortable settings. In both his art and writings, Rossetti exalted Lizzie Siddal. His period of great poetic production began when he met her and ended around the time of her death (Douchy, 155). His poem "A Last Confession" exemplifies his love for Siddal, whom he personifies as the heroine with eyes "as of the sea and sky on a grey day." In this piece, a man's affections for a young girl progress from parental to romantic as the girl ages. Elizabeth Siddal's prominence in Rossetti's works decreased as their love faded and she became increasingly ill. As Beata Beatrix shows, however, Rossetti never forgot his love for his wife, even after her death. Another famous work he produced toward the end of their marriage was his Regina Cordium or The Queen of Hearts (1860). Painted as a marriage portrait, this painting shows a close-up, vibrantly coloured depiction of Siddal. Her shiny, golden hair complements the light orange hue of her heart necklace, and, with an upturned chin, she embodies the regal air implied by the title. Such flattering portraits truly reflected Rossetti's undying affection for his wife. As Siddal came from a working-class family, Rossetti feared introducing her to his parents. 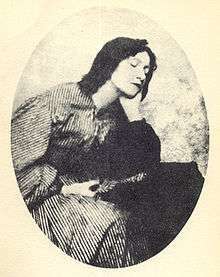 Lizzie Siddal was the victim of harsh criticism from his sisters. Knowledge that his family would not approve the marriage contributed to Rossetti putting it off. Siddal appears to have believed, with some justification, that Rossetti was always seeking to replace her with a younger muse, which contributed to her later depressive periods and illness. Siddal travelled to Paris and Nice for several years for her health. She returned to England in 1860 to marry Rossetti. Their wedding took place on Wednesday 23 May 1860 at St Clement's Church in the seaside town of Hastings. There were no family or friends present, just a couple of witnesses whom they had asked in Hastings. At the time of their wedding, she was so frail and ill that she had to be carried to the church, despite it being a five-minute walk from where she was staying. There is a sanctuary lamp in the church commemorating the wedding and a memorial to Rossetti. After the wedding, as soon as Siddal was well enough, they left for a honeymoon in France. In the previous ten years Rossetti had been engaged to her, he had broken it off at the last minute several times and was known to have had affairs with other women. Stress from the incidents had affected her and she used her frequent and serious illnesses to blackmail him. She became severely depressed and her long illness gave her access to laudanum to which she became addicted. In 1861, Siddal became pregnant. She was overjoyed but the pregnancy ended with the birth of a stillborn daughter. The death of her child left Siddal with a post-partum depression. She became pregnant for a second time in late 1861. Siddal overdosed on laudanum in the early months of 1862. Rossetti discovered her unconscious and dying in bed after having had dinner with her and his friend Algernon Charles Swinburne. After taking Siddal home, Rossetti attended his usual teaching job at the Working Men's College. Once Rossetti returned home and found Siddal he was already unable to revive her and he called for a doctor, who claimed to be unable to save her, upon which Rossetti sent for another three doctors. A stomach pump was used, but to no avail. She died at 7.20 AM on February 11, 1862 at their home at 14 Chatham Place, now demolished and covered by Blackfriars Station. 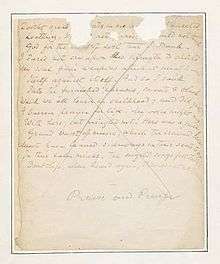 Although her death was ruled accidental by the coroner, there are suggestions that Rossetti found a suicide note. 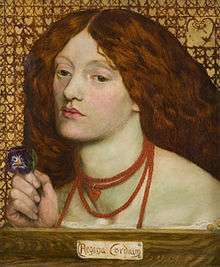 Consumed with grief and guilt Rossetti went to see Ford Madox Brown who is supposed to have instructed him to burn the note – under the law at the time suicide was both illegal and immoral and would have brought a scandal on the family, and suicide would bar Siddal from a Christian burial. One of three surviving leaves from the book of poetry buried with Elizabeth Siddall. Praise and prayer: manuscript, before 1862 MS Eng 769. Houghton Library, Harvard University, Cambridge, MA. Overcome with grief, Rossetti enclosed in his wife's coffin a journal containing the only copy he had of his many poems. He supposedly slid the book into Siddal's red hair. She was interred at Highgate Cemetery in London. By 1869, Rossetti was chronically addicted to drugs and alcohol. He had convinced himself he was going blind and couldn't paint. He began to write poetry. Before publishing his newer poems he became obsessed with retrieving the poems he had slipped into his wife's coffin. Rossetti and his agent, Charles Augustus Howell, applied to the Home Secretary for an order to have her coffin exhumed. It was done in the dead of night to avoid public curiosity and attention, and Rossetti was not present. Howell reported that her corpse was remarkably well preserved and her delicate beauty intact, probably as a result of the laudanum. Her hair was said to have continued to grow after death so that the coffin was filled with her flowing coppery hair. The manuscript was retrieved although a worm had burrowed through the book so that some of the poems were difficult to read. Rossetti published the old poems with his newer ones; they were not well received by some critics because of their eroticism, and he was haunted by the exhumation through the rest of his life. Fiona Mountain's 2002 mystery novel Pale as the Dead centres a "genealogical mystery" around the fictional descendants of Elizabeth Siddal and Dante Gabriel Rossetti. In the novel, their newborn daughter is not stillborn but is stolen by the family doctor, who was in love with Siddal. Elizabeth Siddal's mysterious ailments are explained as a genetic heart defect that has been inherited by her great-great granddaughter Bethany, a young woman who is modelling for photographs inspired by the Pre-Raphaelite paintings. Mollie Hardwick (author of Upstairs, Downstairs) wrote a mystery novel entitled The Dreaming Damozel in 1990. The plot follows antique dealer Doran Fairweather, who is elated to find a small oil painting she believes to be of Elizabeth Siddal but is shocked when she happens on the body of a girl, floating dead in a pond. 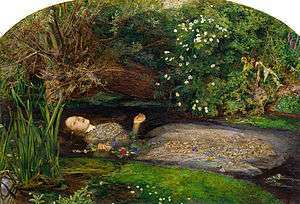 The death scene mimics the Millais painting of Ophelia featuring Elizabeth Siddal. Doran' excited by the coincidence and mystery, ignores the advice of her husband who warns her the story of Rossetti and Siddal was plagued by unhappiness. In Tim Powers' 2012 novel Hide Me Among the Graves, "Lizzie" Siddal is a victim of the vampire John Polidori, her husband's uncle and author of what is likely the first vampire story. This becomes an explanation for her illness and death, as well as for her husband's exhumation of her grave, which is not to regain his poems but is part of a strategy to defeat the vampire. Rossetti's relationship with Siddal has been the subject of television dramas, notably Dante's Inferno (1967), by Ken Russell, in which she was played by Judith Paris and Rossetti by Oliver Reed; The Love School (1975) in which she was played by Patricia Quinn; and Desperate Romantics (2009) in which she was played by Amy Manson. Ghostland is a 2001 album by the Seattle neo-psychedelic band The Goblin Market named after a poem by Christina Rossetti, and the album is inspired by the exhumation of Elizabeth Siddal. Elizabeth Siddal, Dante Gabriel Rossetti and Algernon Charles Swinburne are the subjects of the short comics story How They Met Themselves, by Neil Gaiman, drawn by Michael Zulli, and published in Vertigo: Winter's Edge #3 (2000). The title makes reference to the Rossetti's 1864 painting. In it, a dying Elizabeth drugged with laudanum revives the last New Year's Day, in which the trio had a train trip to a magic forest owned by Desire, the androgynous sibling of Sandman. Lizzie Siddal, a play written by Jeremy Green, was performed at the Arcola Theatre, London in 2013. "Ophelia's Muse," a work of art historical fiction by Rita Cameron that was published in September 2015 by Kensington Press, tells the story of Siddal and the Pre-Raphelites. Sleep, Pale Sister, a Gothic novel set in the Victorian art world by the author Joanne Harris, draws heavily on the character of Lizzie Siddal and her relationship with Rossetti. ↑ Ash 1995, p. 4. ↑ Marsh, Jan (1985). The Pre-Raphaelite Sisterhood. New York: St. Martin's Press. ISBN 0312637381. ↑ Ash 1995, pp. 4, 7. 1 2 Hawksley 2000, p. 96. ↑ Gaunt, William (1966). The Pre-Raphaelite Dream. New York: Schocken. p. 64. ISBN 080520119X. Retrieved 25 September 2016. ↑ "Hardwick, M", British Crime Writers List, NL: XS4 all . ↑ Roeberg, Shelly, ed. (2000), "Winter's Edge", Vertigo, 3, 1700 Broadway, New York, NY 10019: DC Comics, Barcode 76194121118300311 . ↑ Lizzie Siddal, Arcola theatre . Ash, Russell (1995), Dante Gabriel Rossetti, Harry N Abrams, ISBN 0-8109-3784-0 . Cherry, Deborah (1993), Painting Women: Victorian Women Artists, London: Routledge, ISBN 0-415-06053-2 . Daly, Gay (1989). Pre-Raphaelites in Love, New York: Ticknor & Fields. ISBN 0-89919-450-8. Lewis, Roger C. & Lasner, Mark Samuels (Eds.) (1978). Poems and Drawings of Elizabeth Siddal, Wolfville, Nova Scotia: The Wombat Press. ISBN 0-9690828-0-0. Marsh, Jan (1992), The Legend of Elizabeth Siddal, London: Quartet, ISBN 0-7043-0170-9 . Mountain, Fiona (2002), Pale as the Dead, Signet, ISBN 0-451-21617-2 . Prose, Francine (2003), "Elizabeth Siddal", The Lives of the Muses, London: Aurum, pp. 99–136, ISBN 1-85410-944-8 . Hawksley, Ludinda (2000), Essential Pre-Raphaelites, London: Parragon, ISBN 1-84084-524-4 . ——— (2004), Lizzie Siddal: The Tragedy of a Pre-Raphaelite Supermodel, London: André Deutsch, ISBN 0-233-00050-X . Morrissey, Kim (1998). Clever as Paint: The Rossettis in Love (playscript), Toronto: Playwrights Canada Press. ISBN 0-88754-552-1. Surtees, Virginia (1991). Rossetti's Portraits of Elizabeth Siddal, Aldershot: Scolar Press. ISBN 0-85967-885-7. Wikimedia Commons has media related to Elizabeth Siddal.